My dog is getting older and his veterinarian recently recommended giving him a glucosamine supplement for his joints. Has ConsumerLab.com tested these, or other supplements for pets? Yes. ConsumerLab.com has tested glucosamine, as well as a variety of other supplements for pets. 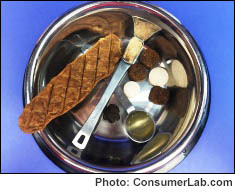 ConsumerLab.com has included supplements specifically for pets within larger reviews focusing on supplements for people in the following reviews: Multivitamins, CBD Oil, Fish Oil and Omega-3 Fatty Acid Supplements, and Seed Oils (Flaxseed, Evening Primrose, and Borage), and Probiotics. My dog eats Prescription Diet j/d dog food, It has all the necessary fish oils in it for mobility. It is expensive and you can only get it from a Vet but it lasts a while. Sometimes I mix another high quality dog food in it for flavor. My dog tore her ACL about 2 years ago and is doing fine. If your dog has hip pain, I would suggest trying SAMe as an arthritis supplement. We have used it on our golden retriever and it stopped his chronic degenerative limping within a few days, and he started actually running again! We just buy the Nature Made SAMe at Costco, break the pills in half and feed them to him each day. This CL Answer initially posted on 7/4/2015. Last updated 4/25/2019.